The following initiatives, collectives, and organizations are expanding access to reading materials in mother languages by compiling online digital libraries. The following sites provide to access to a range of materials in hundreds of languages spoken around the world. The Global Book Alliance seeks to have provide high-quality books and reading materials for children all over the world in languages that they understand. The goal is to have books in over 300 languages. Currently, they have 6,000-7,000 available titles. The primary purpose of Bloom is to provide a place where writers can develop books in their languages and then to allow sharing of those books, so that they can be used by others and adapted to new languages and for different populations. Over 3,000 books will be available in over 80 languages. Books continue to be developed in many languages, written by local authors. Provides multilingual stories in 14+ languages with text and audio. Although this website primarily targets immigrant and refugee students in Canada, it should be useful for adult learners who are becoming literate in their first language, since they can read and listen to stories in their own language, and thus help make connections between text and speech. Story Weaver is a digital library of 6,579 stories in 113 languages (and growing) at various levels. All stories and illustrations are available under open licenses to give people the right to share, use, translate, or build upon the existing body of work. Stories can be downloaded for printing or for adaptation in an e-publication software. The goal of the Global Digital Library is to expand access to and availability of high-quality mother tongue resources worldwide by providing openly licensed, downloadable materials that allow sharing, electronic use, and large-scale printing, as well as links to other sources for those materials. Room to Read seeks to transform the lives of millions of children in low-income communities by focusing on literacy and gender equality in education. Working in collaboration with local communities, partner organizations and governments, they develop literacy skills and a habit of reading among primary school children, and support girls to complete secondary school with the relevant life skills to succeed in school and beyond. This site provides open access to picture storybooks in the languages of Africa. The collective aims to promote children’s literacy, enjoyment and imagination. All stories are animated with culturally appropriate and relevant drawings to keep students engaged. World Reader provides a mobile app, which works on smartphones and simple feature phones. This resource contains more than 42,000 books in 43 languages from 150 publishers around the world. It includes story books and textbooks in multiple genres. All Children Reading is a compilation of digital libraries that provide early grade reading materials in local languages. The aim is to help educators quickly identify accessible materials in mother tongue languages. Materials can be searched for by regions and features (accessibility, platform type, and availability offline). SIL has worked in many language communities around the world, especially those which might be termed “minority” or “local” and where commonly high numbers of people are not literate, either in their own language or in any other language. In many of these situations, literacy materials have been developed after initial language analysis and orthography development. The site is a sister site of Storybooks Canada, which is itself a derivative of the African Storybook. Part of our vision is to reverse knowledge flows, so that innovations in the Global South can be shared worldwide under the umbrella site Global Storybooks. 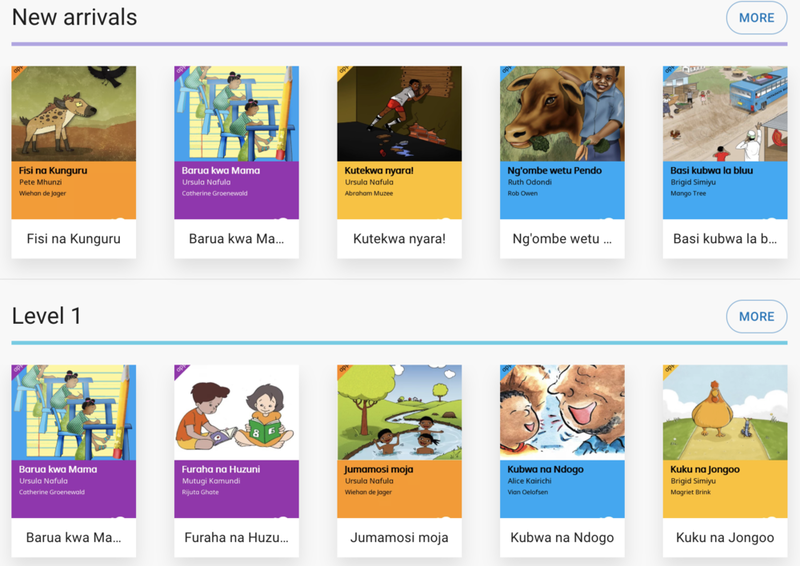 We are also working on audio versions of the African Storybook stories, as this will be helpful for children learning to read, in multiple languages, whether in African countries or other countries internationally. Unite for Literacy hosts many books categorized by topic. The books have color pictures and large font for easy reading on various digital devices. The books are narrated in a number of languages including Hmong, Karen, Somali, French, Spanish, Nepali and more!